Having a baby is a wondrous, life-altering experience for parents. There are many questions that you will have when you are nursing your child if you are a first-time parent. There are several concerns that you will have about feeding your baby and you may face many challenges while caring for your infant – one of them is ensuring that the milk is at the right temperature before feeding your baby. Breast milk is a very rich, nutrient-dense substance – it easily loses some of its nutrients content if it is not heated to the right temperature, or fed to the child at the optimum temperature. Baby bottle warmers have solved a lot of such problems for nursing mothers. The best baby bottle warmers are portable, easy to use, and always ensure that your child never loses out on the vital nutrients present in breast milk. This has been a significant advantage to mothers all over the world, especially those who are working or have to travel often. In this article, we tell you about some of the bottle warmers for nursing mothers available in the market today. 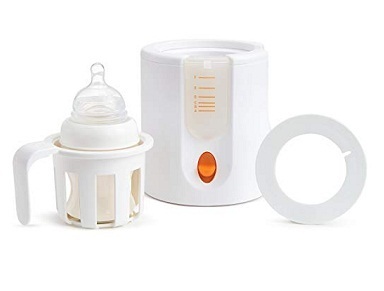 This bottle warmer for breast milk is known for its gentle and even heating. Breast milk loses a lot of nutrients if it is not heated evenly, and this warmer prevents that issue. The bottle warmer comes with an easy to use LCD control panel, complete with a one-button start function. The easy-touch keypad also improves its usability by a considerable measure. You will be able to start it up and heat the milk in a jiffy since this bottle warmer offers that function. The bottle warmer can be used to warm the milk several times before you will have to refill the water. This is a boon since a large amount of hassle is reduced from the life of busy parents. The warmer also has audio and visual cues to let parents know when the warming cycle is complete. You can spend your time tending to the baby and do not have to keep watch over the warmer, waiting. The basket of the warmer fits many bottles, each of different size. You do not have to procure other bottles just for this warmer. There is an auto shut-off feature, which kicks in after ten minutes of heating. The warmer is of the 110V voltage requirement, which means that it can only be used in nations like the USA and Canada. The weight of the bottle warmer is close to 2 pounds, which can be slightly on the heavier side. The reservoir is tinted, which means that it is difficult to ascertain if the water needs to be refilled. The product is highly adjustable, which means that you can use it with minimal hassle. The auto shut-off feature is also extremely convenient for the parents. 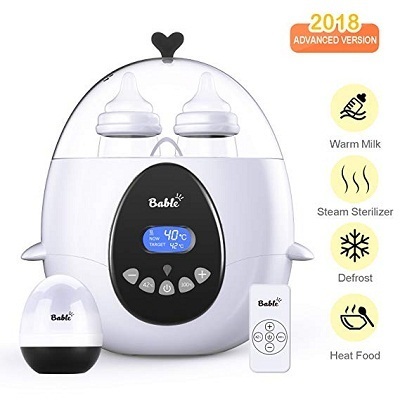 This bottle warmer for breast milk is known for its gentle and even heating. Breast milk loses a lot of nutrients if it is not heated evenly, and this warmer prevents that issue. The defrost setting can be useful when you want to defrost not only breast milk but other baby foods, too. The size of the warmer is small, which makes it fit easily into most counters and nightstands. It is also one among the best travel bottle warmers in the market. The weight of the warmer is only 1.55 pounds, making it extremely portable. 5 oz of milk can be heated to the optimum temperature in as less as 3 minutes, with this warmer. The lack of an automatic shut-off feature or a timer can be a problem for parents who are busy. The warmer is only compatible with other Philips Avent products, which can be an issue for parents who already have their bottles. 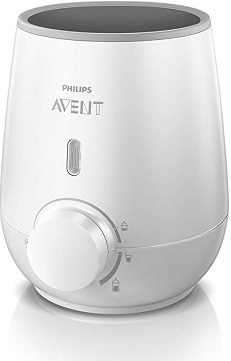 The Philips Avent warmers are comparatively light, thus making them extremely portable and easy to use. The design of the dial is simple, and the warmer is quite quick to warm the milk. 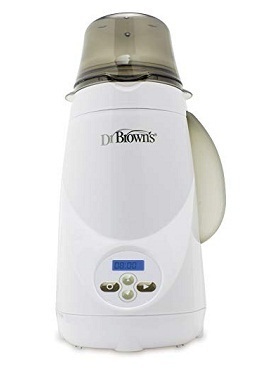 This bottle warmer not only heat breast milk but can also be used for a range of purposes like defrosting food, sterilizing baby bottles and heating other complementary infant foods. Formula milk can be brewed in as less as 10 seconds, with this warmer. The LCD shows the real-time temperature and the set temperature, making it easier for parents. The Remote Control ensures that the warmer can be controlled from afar. The bottle warmer is compatible with almost all sizes of baby bottles. The warmer is heavy, at almost 2.5 pounds in weight. The refilling of the water has to be done after measuring the water each time, owing to a lack of internal lines. This warmer is extremely multifunctional, as it can be used for a range of daily tasks. The remote control also improves the ergonomics of the warmer to a great extent. The Munchkin High-Speed bottle warmer comes in an orange and white color combination and is lightweight, weighing 1.4 pounds. It heats the milk very quickly and prevents the loss of nutrients which can happen due to uneven heating in a microwave. The steam warming system heats the milk and food evenly, without hot spots. Auto shut-off feature and the on/off indicator, along with the alarm can notify you when the milk is ready. The adapter ring is useful when you want to heat smaller bottles for your baby. The measuring cup makes it easy to refill the water for consistent warming. The warmer has an input voltage of 120V, which means that it can be used only in nations like the USA and Canada. The steam condensation can be harmful to the cabinets and other plastic utensils nearby. This product is the ideal portable bottle warmer and is easy to carry as it is lightweight. It is also easy to use, owing to its simplicity. The Kiinde Kozii Bottle warmer comes with a timer that is remarkably easy to use and read. 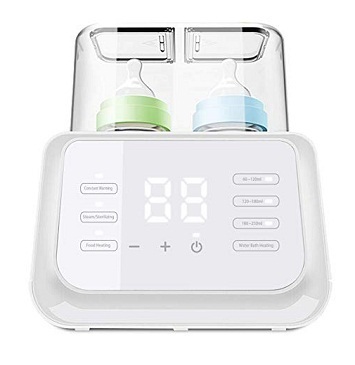 It also has a flowing water bath that ensures the breast milk is heated evenly without any hot spots that can be dangerous for your baby. The auto shut-off feature ensures that the heating stops once the time is up. The Universal Warming Chamber in the warmer easily accommodates not just breast milk, but even formula, storage bags and even glass jars. The product is delicate, so it will require to be handled carefully. The warmer requires thorough cleaning after each use, to ensure its integrity. The warmer is simple to use, portable and overall a good place to begin at. The universal chamber ensures that the warmer is useful even after you have stopped nursing the child. 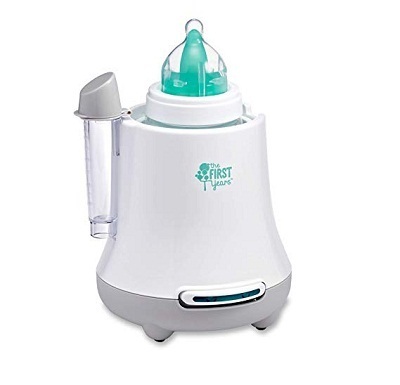 The First Years Bottle Warmer is simple, easy to use, and warms up the breast milk in a matter of minutes. The auto-shutoff feature present is useful since it prevents over-warming or over-usage of the warmer. The warmer can be used with a wide array of bottles, including wide, narrow, angles and even disposable bottles. The measuring vial for refilling the warmer is included in the kit. The basket with the lid provided can be used to sterilize pacifiers, too. There is no temperature setting available in the warmer, for accurate heating. The power requirement of 110V means that you will be unable to use it in a lot of nations outside the USA and Canada. The warmer is delicate and hence requires careful handling. The lightweight and the great functionality of the warmer can help a lot of parents in their daily tasks. The warmer also accommodates a range of bottles, which will definitely be useful at some point. 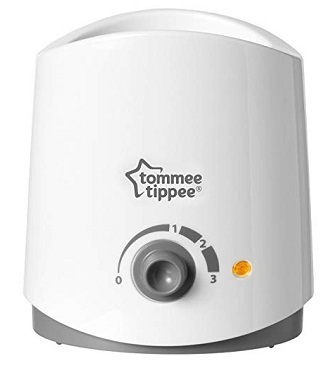 With this Tommee Tippee bottle warmer for breast milk, you can warm up the milk evenly and quickly, while ensuring that no vital nutrients are removed in the process. The warmer is super-easy to use, and the temperature can be controlled to three settings using the dial on it. It takes only about 4 minutes to warm up the bottles of breast milk or formula milk. The product is BPA and Phthalate-free, which ensures that no harm comes to your child via using this warmer. The warmer is compatible not only with Tommee Tippee Bottles but also with most other baby bottle designs. The bottle weighs extremely less at 1.1 pounds, compared to other warmers. The warming process is slower, compared to a warmer that uses a steam bath. Depending upon the thickness of the bottle you put in, the warming time may increase significantly. The product is perfect for travelling mothers since it is extremely light and also easy to use. The warmer also has a simple interface for users, ensuring that you can warm your bottle with minimal fuss. The Owlpow multifunctional warmer can be used not only to warm up breast milk, but also for a variety of other uses like defrosting milk or baby food, and steam sterilizing other items. The milk heats up in as quickly as 3 minutes, which makes it extremely convenient to use. There is the auto shut-off feature which ensures that the item stops heating or sterilizing after the prescribed time. Constant temperature heating feature is useful since it allows the parents to forego the hassle of warming up the milk at odd times of the night. The luminous display panel of the product makes it easy to use it at night. The product has been certified to be BPA free, so it poses no harm to your baby. The product weighs around 2.5 pounds by itself, so it can be difficult for parents to lug it around. The portability of the product is comparatively low. Extremely multifunctional, this product is straightforward to use, too. The luminous display and the many functions are an advantage, and the product is sure to reduce the hassle of heating milk during the night time. 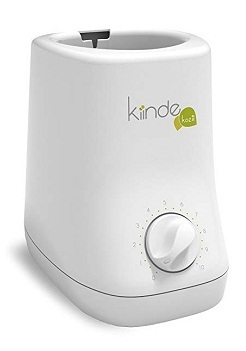 Finding a nice baby bottle warmer is harder than it seems like, even though there are a lot of options for parents. We hope this list of best bottle warmers will help you make a decision. Ideally, the best bottle warmer will be one that is easy to use, easy to handle, lightweight and is multifunctional. However, ticking all these boxes at the same time may not possible, in some cases. Therefore, you will have to choose between bottle warmers depending on your lifestyle and your specific requirements. If your baby often wakes up in the middle of the night, something with a constant temperature heater is sure to improve the quality of your sleep hugely. Similarly, lighter bottle warmers are perfect if you have to travel often taking your baby. There is no doubt that in the first years, bottle warmer is necessary for all parents – it can largely reduce the number of temper tantrums. Therefore, it is up to the parents to make a wise decision and choose what they think is the best option for them.